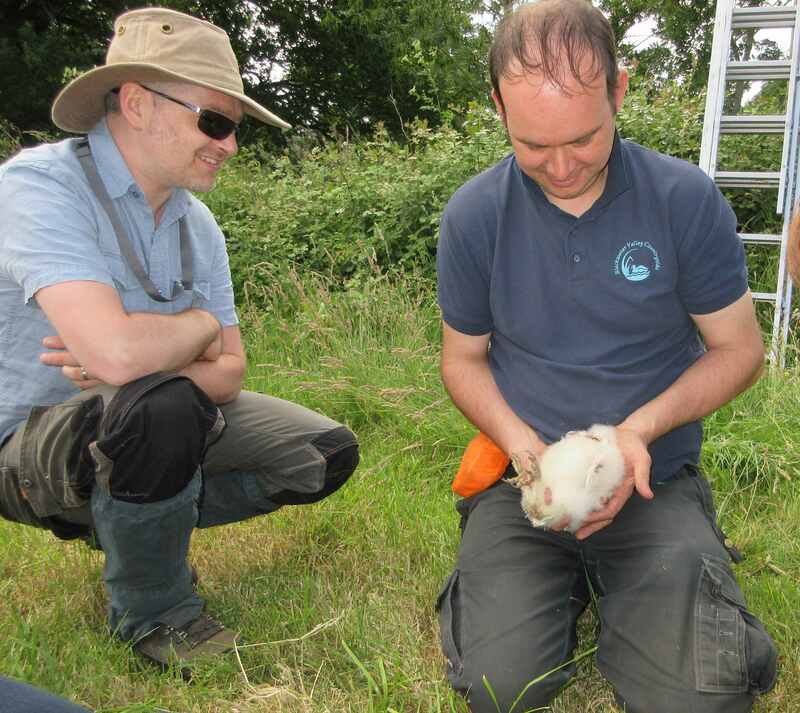 Last week volunteers joined us for two days of monitoring for the Wokingham Borough Barn Owl Box Project, to check on the population and health of Barn Owls in the nest boxes we installed, across Wokingham Borough and the lower reaches of the Blackwater Valley. 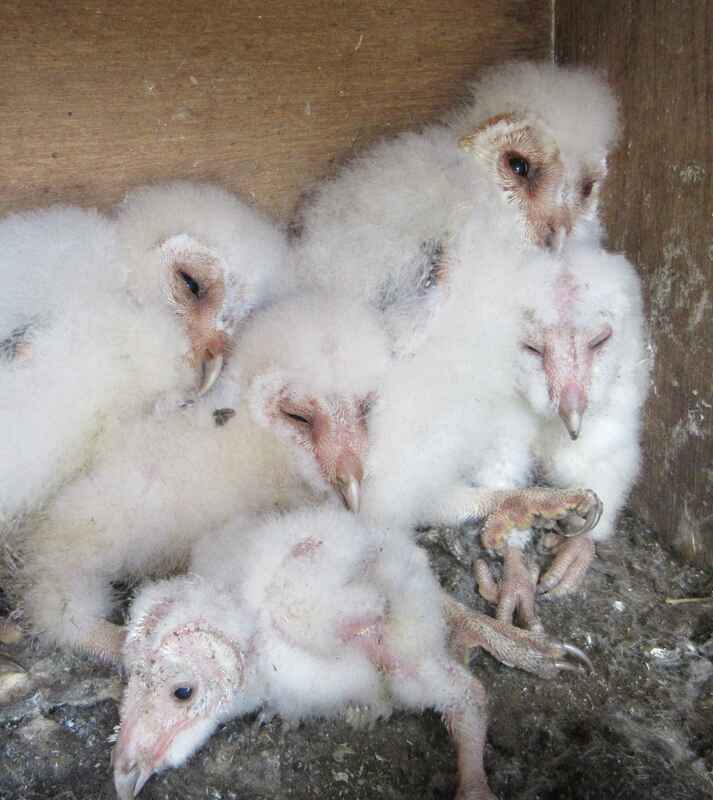 We’ve been monitoring and maintaining the nest boxes since 2002 to help the Barn Owl population recover. 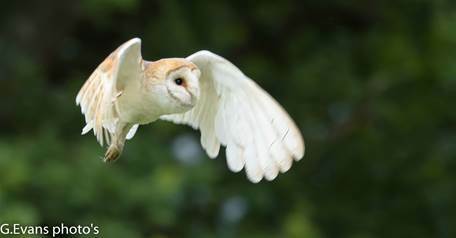 Our nest boxes form part of a national network with the support of the Barn Owl Conservation Network (BOCN) and the British Trust of Ornithologists. Together these are thought to support 1/3 of the Barn Owl population. These protected raptors need a Schedule 1 License accreditation to inspect the boxes, which I’ve gained through the kind support of Andy Glencross & Duncan Fisher (Wokingham Borough Council) and the training by Colin Shawyer (BOCN Coordinator for UK & Ireland). 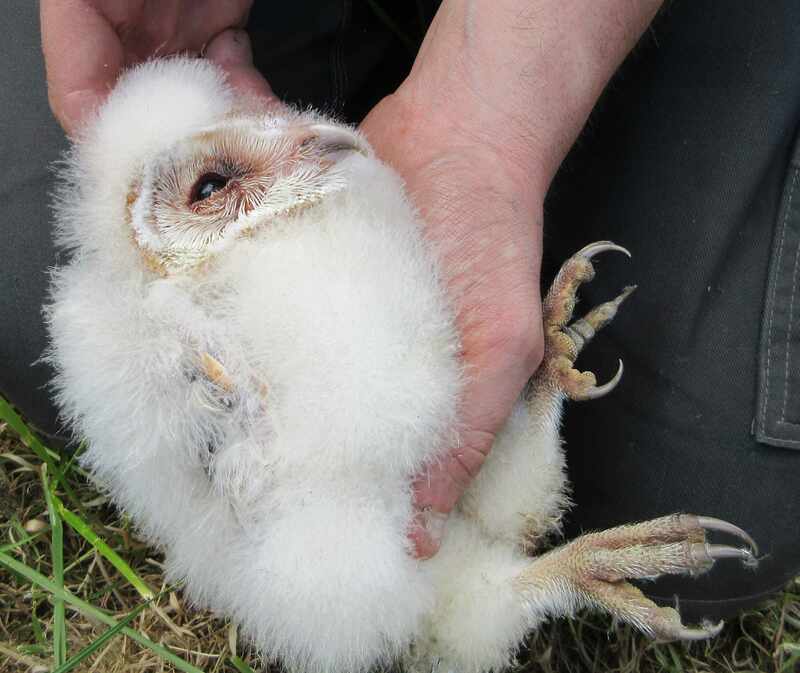 The survey is carefully timed to minimise disturbance on the owls, and ensures we can monitor the health of the chicks. We also clear out boxes that would otherwise remain blocked by debris collected by less desirable species, such as Grey Squirrels. As shown in the photo above it is usual to see a range of chick ages since eggs are laid 2-3 days apart. The youngest 1.5 weeks old one is lying down because they don’t build up the muscles to stand upright until around 2 weeks, whereas the largest is already developing a facial disc at 4 weeks old, ready to fledge at around 8 weeks old. Whilst the nest box locations remain confidential in order to safeguard these protected species, I am able to summarise the overall results for the project. In 2017 there was a Barn Owl occupancy of 50% in the local nest boxes. A high occupancy rate was also observed nationally, thought to be due largely to the high vole population which has a cyclic 3-4 year trend (BOCN, 2017). Of these occupied boxes, fewer pairs were nesting with breeding seen in only 29% of the Wokingham boxes. The preliminary Wokingham survey data from 2018 shows a bumper year for Barn Owls with both occupancy and breeding seen in 62% of the 16 nest boxes. It is very encouraging to see Barn Owls breeding in all of the occupied boxes this year. The egg laying dates have varied more than usual, with young found dispersed along the age range from eggs up to 4.5 week old chicks. This may be a result of the the wet spring delaying egg-laying in some cases. It will be interesting to see how this compares to the national data when it’s compiled. Whilst each species of raptor has its own patented nest box design, it’s rather fortuitous that other desirable species also seem happy enough in Barn Owl boxes. One of the designs we use, a pole box, even has a second attic compartment which proves popular with Kestrels. This year Kestrels bred in 1/4 of the Barn Owl boxes – a very welcome surprise. 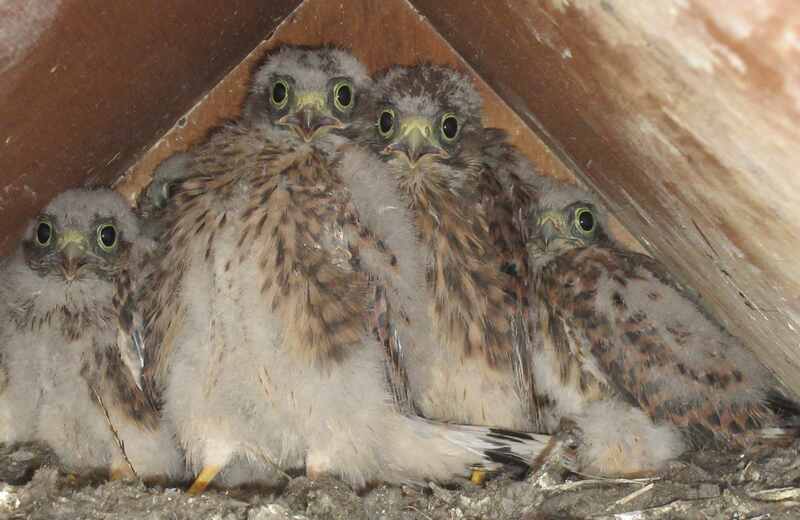 Kestrel chicks in the attic – Can you spot the 5th chick? Thank you very much to all the partners, land owners and volunteers, without whom the continued success of this project would not be possible. 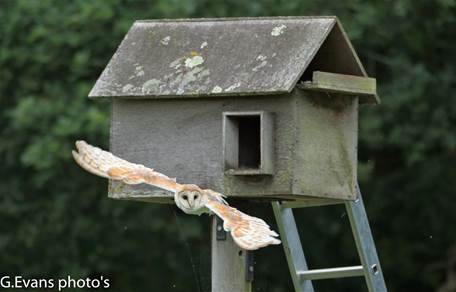 This entry was posted in Conservation, Moor Green Lakes, Volunteers, Wildlife and tagged barn owl, Volunteers, wildlife. Bookmark the permalink.